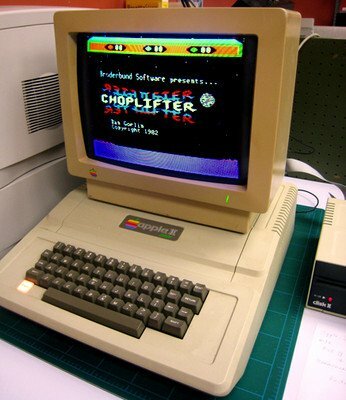 Here is a great find, a working Apple II Plus Complete System with Software running the classic Choplifter game. Dual floppy drives, total of 5 floppy drives and the original working color monitor. The Apple II series was a set of 8-bit home computers that was the first highly successful mass-produced computers designed primarily by Steve Wozniak and manufactured by Apple Computer. The series was introduced in 1977 with the original Apple II. If your looking to purchase a vintage Apple, browse through our Vintage Apple II page.